Thrill seekers will get the chance to ride the UK’s highest zipline in ambitious plans to turn Hillend into one of Scotland’s leading leisure attractions. The 500-metre ride would see daredevils reach speeds of up to 50mph as the Snowsports Centre is turned into an all-year-round venue. Leisure chiefs at Midlothian Council are currently seeking feedback on proposals that also include an alpine rollercoaster ride, shops, hotel, food hall and glamping facilities. Cabinet member for sport and leisure, Councillor Derek Milligan said: “We’re very excited about the potential leisure and economic benefits an expanded year-round facility at Hillend could bring to the local area. 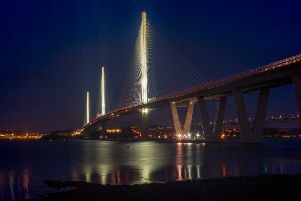 Images of how the zipline might look show the 30-second ride at between two and 20 metres above ground level affording stunning views to the Forth. The alpine coaster would be the longest in the UK – at 800m – and feature bobsled-like cars on tracks notching up 25mph. A huge food court would include six outlets, a large communal eating area, viewing platform and function space for weddings, parties and corporate events. Visitors would be able to stay overnight in 30 glamping or wigwam units or at a 100-bed hotel on the site of the current reception building. An activity dome with high ropes and soft play would be built, while the freestyle jump slope would be upgraded and extended. “We think enhancing the current facilities with the highest zipwire in the UK, the longest Alpine coaster and the indoor climbing and soft play will attract families from all over the country and beyond,” said Cllr Milligan. “While the plans are just proposals currently, we are looking for feedback from local people to help shape our future planning application. Anyone keen to give their views can attend a drop-in session at Midlothian Snowsports Centre between 2pm and 7.30pm on Monday, January 28. The Evening News reported two years ago on Hillend plans for a new international standard freestyle course. The £104,000 scheme would see the existing freestyle section more than doubled in length with new jumps, ramps and halfpipes. The construction work would be planned in phases in a bid to minimise disruption to the existing facilities. Snowsport Scotland chief executive Trafford Wilson said: “Strategically, we want to get more people involved in our sport and also to see more successful athletes performing at winter games.